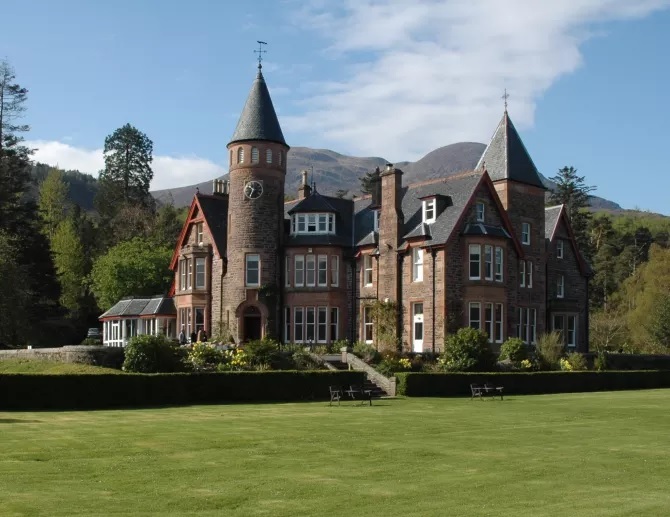 EDINBURGH, Scotland, 2018-Jun-29 — /Travel PR News/ — A Highland hotel set on the edge of a sea loch with beautiful views of the Torridon mountains has achieved VisitScotland’s most prestigious Quality Assurance (QA) accolade. The Torridon has achieved a 5 Star Gold award from the national tourism organisation. The beautiful property comprises 18 luxury rooms – from classic to superior and master to deluxe – all individually designed and decorated with fine furnishings and fabrics. With the gourmet restaurant, 1887,The Inn pub and the whisky and gin bar available, The Torridon is delighted to have achieved its Taste Our Best (TOB) award. TOB is designed to raise quality standards and promote the use of Scottish produce within the tourism industry. The joint initiative between VisitScotland and the Scottish Government, with support from Scotland Food and Drink, aims to form stronger links between the places people visit and the food and drink experiences on offer. Staff at The Torridon pride themselves on it being a sustainable business and holding a gold award within the Green Tourism Business Scheme (GTBS). GTBS is the largest and most established scheme of its type in the world and is an important part of Scotland’s future towards a sustainable tourism destination. With a big focus on supporting the local community and helping its guests make the most of their time in the area, The Torridon has also joined an impressive network of VisitScotland Information Partners (VIP), committed to providing local information to visitors. As well as taking part in the QA scheme, VIP, TOB, and GTBS, owners Dan and Rohaise work hard to cater for a wide range of visitors, as evidenced by their participation in the Walkers,Bikers and Cyclists Welcome schemes. Welcome schemes have been developed by VisitScotland to complement star gradings and to guide those visitors with a range of interests to businesses that pay particular attention to their varied needs. Star gradings and welcome schemes help visitors make informed decisions and select businesses that meet, and exceed, these expectations. Chris Taylor, VisitScotland Regional Leadership Director said: “I would like to offer my sincere congratulations to owners, Dan and Rohaise on attaining such an outstanding award from VisitScotland – well-deserved. “Dan and Rohaise are very proud owners of the property who have been investing heavily in growing their business over the years and are a great example of a business that is working in partnership with VisitScotland – making the most of our opportunities and drawing on the impartial advice and experience to invest in and develop their business. “Tourism is more than a holiday experience – it is the heartbeat of the Scottish economy and touches every community, generating income, jobs and social change. Dan and Rohaise have shown excellent leadership skills, they are extremely passionate about food, service, provenance and promoting hospitality as an Industry of choice, especially for young people – The Torridon is now a major employer in the local area. This entry was posted in Hospitality, Hotels, Tourism, Travel, Travel Awards, Travel Management, Travel Marketing, Travel Services and tagged Chris Taylor, Dan Rose-Bristow, The Torridon, VisitScotland. Bookmark the permalink.